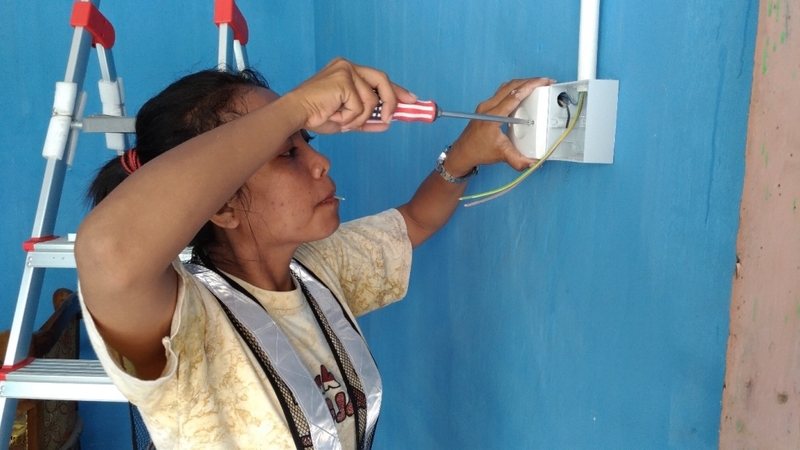 As the only female staff working at RESCO, a renewable energy service company established under the Sumba Iconic Island platform, Jetty Arlinda Maro, 26, has to work twice as hard as her male colleagues to prove her capacity. Unlike those men, she is not only responsible for electrical installations, she is also the facilitator and administrator in charge of making sure of the completeness of all the necessary documentations in field offices. In just less than two months, her excellent work results led her to be interviewed by a journalist from Jakarta. Born in Waingapu, Jetty holds a bachelor degree in electrical engineering from Nusa Cendana University in Kupang, Nusa Tenggara Timur province. Her career at RESCO began almost accidentally because she didn’t see the advertisement for the position; her sister had to tell her about it. With a matched educational background, she sent her application on the very last day. During a test with PLN, the state-owned electricity company, that she was required to pass to work with RESCO, she was told by one of the senior RESCO staff present—a man—that there was no place for a female in the company. However, much to her surprise, nevertheless at the end of July, RESCO HR called to offer her a position. “Working at RESCO isn’t much different from my university life: I was in a man’s world then and still am now,” said Jetty. “I am the only woman among short-tempered men and I am often underestimated. But I have made a few friends here and I have managed this challenge and survived until today. More stories on Jetty can be found on Sumba Iconic Island website.